First Impressions: The patterns look so sleek and sophisticated in this book. I am noticing lots of how-to pictures throughout the book. I wonder, if this means that everything is super complicated. The Details: This book contains 27 scarves. Although the author states that the book contains a range of skill levels, the scarves are for the adventurous, advanced beginner and beyond for the most part. The scarves take advantage of texture-based stitches and patterns to make them visually interesting. Many of the patterns rely on the knitter knitting stitches out of order or arranging the stitches on multiple double-pointed needles. Looking through the patterns, these scarves have a bit of a more feminine flavor to them; however, they could be made to look more stereotypically masculine with the right color choices. Final Impressions: These scarves are gorgeous. They look like they should be in a museum, not on a person. Although I want to wear almost all of them, I am concerned that they all look fiddly to knit. 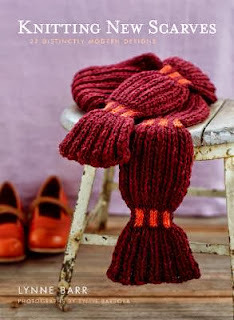 If you love to knit scarves and like to try new techniques, this is the book for you.